Baking powder is a raising agent. A raising agent is also known as a leavening agent. Raising agents are used to make baked or fried goods like cakes, quick breads, beignets and biscuits rise. Most commercially available baking powders are made up of sodium bicarbonate (Baking Soda, Bicarbonate of Soda), an acid ingredient (e.g. monocalcium phosphate or tartaric acid) and a drying agent, usually cornstarch. When you add baking powder to a wet cake batter or beignet dough and apply heat by placing it in the oven or hot oil, the acid ingredient in the baking powder, reacts with the sodium bicarbonate to give off carbon dioxide and this causes the cake or beignet to rise. 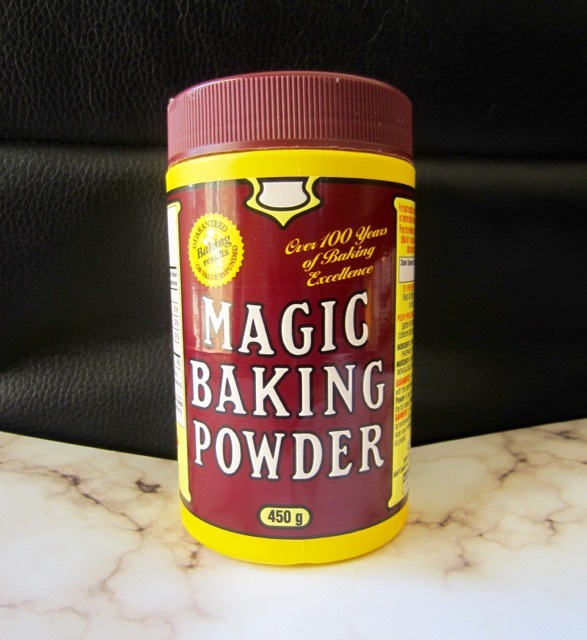 I use Magic Baking Powder and the ingredients are: Sodium bicarbonate (an alkaline), Monocalcium Phosphate ( an acid) and Cornstarch (drying agent). Keep baking powder tightly closed in a cool dry place. Baking powder should be used within one year of opening or by “sell by date” whichever comes first. © My Favourite Pastime 2018, unauthorized use and / or duplication of this material without written permission from the author / owner of this blog is strictly prohibited. Links are allowed when clear credit is given to myfavourite pastime.com with appropriate and specific direction to the original content.